Astrofarm - For more than just Astronomy. Friday 15th October. We made our way from our little corner of Herefordshire to Portsmouth where we were booked onto the overnight ferry to Le Havre. The overnight journey to France is a familiar one to us, usually to the alternative port of Ouistreham, but this time Le Havre was the destination port of choice. So, where were we going? Well, it was time for a break and time to head for deepest darkest France and Astrofarm. It's about a 6 hour drive (including a couple of stops) from when you leave the ferry in the morning down through the country to the outskirts of the small pretty town of Confolens. If you've never driven through France before, let me assure you, it's a breeze. Don't let the thought of being on the 'wrong' side of the road put you off at all. You soon get used to it, and once you're out of the port city of Le Havre, you have the welcome site of the French Peage toll motorway system and the Route Nationale to get you down the country extremely efficiently. Hold ups on the road networks are quite rare in France, providing you're avoiding the major cities, so for the trip half way down France, it's some of the most stress free driving you will experience. For us, 6 hours of very easy driving to get to Astrofarm is definitely worth the effort if it means having the flexibility of your own transport for the week to go exploring! When we arrived, we were welcomed by a menagerie of animals, and of course, our hosts, Sue and Andrew. Astrofarm was bustling when we arrived. Andrew had just returned from collecting some guests from the local town, and Sue was mid way through giving some locals a tour of the establishment and everything it has to offer. Astrofarm offers bunkhouse accommodation, or a double room which is a little more private, both on a B&B basis. However, we chose to stay in the recently acquired Gite at the end of the drive on a self catering basis. It is based on accommodation for 4 people in a double room and twin room and has a large lounge leading onto the balcony. Though you can just book one of the rooms and have use of the communal living area and kitchen, you can also book out the whole Gite to give you exclusive use. This is what we did, allowing us to come and go as we pleased and provided us with an excellent base for our holiday. This is an area of France that we have not been to before. We chose Astrofarm as the location partly because of my interest in astronomy, but mainly to be able to get out an about and discover this region of the country. We started with quite an easy day on the Sunday, and leisurely walk around the local town of Confolens. Sue and Andrew had suggested that we paid a visit to Arthe which quickly became the find of the holiday. It's run and owned by Nick and Mary, along with their own B&B and takes prime position on the riverbank next to the original pedestrian bridge across the river. Visiting this establishment at least once during your stay is a must! We went 3 times in total! The cheesecake is to die for, and the coffee is simply sublime! Another place on our list of places to visit while staying at Astrofarm was the medieval port city of La Rochelle. It's about a 2 hour drive to the Atlantic coast from Confolens, but it really is worth the visit. As well as being etched in the mind of many a 80's and 90's school child for its repeated appearance in the old 'Tricolor' french text book, the city is blessed with a thriving mix of medieval architecture mixed with the new buildings of some of the revamped port areas. With plenty of parking throughout the city, it was a great day out topped off with moules et frites in one of the many restaurants dotted around the harbour area. The most humbling visit of our holiday was a visit to the village of Oradour-sur-Glane. If perhaps you aren't aware of the history of this village, it's well worth looking it up before you go. 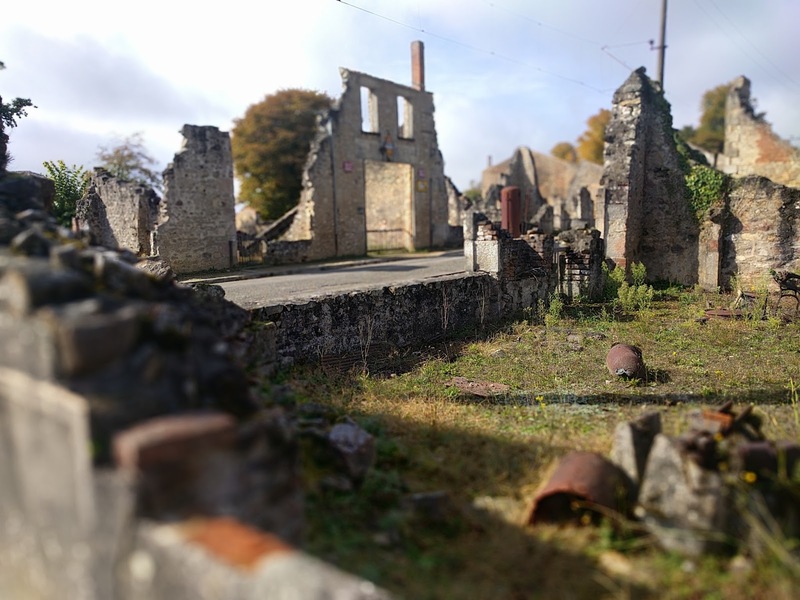 Oradour-sur-Glane was the location of the most vile of war crimes committed by the German SS and Nazi regime on 10th June 1944. The village has been left as it was in the days following the annihilation of it's inhabitants by the SS. I won't go into the full history of it here. There are much better references to it available on the internet and in the history books, but least to say it is a place and a visit that I will never forget. I do have one piece of advice though, and that is it visit the bookshop in the visitor centre before visiting the exhibition and making your way into the village itself. Buy one of the guides (available in many languages including English) and take some time to read through it as you go around the village. It will really help explain what you are looking at, and give detailed information on the different buildings around the village. On a day where we wanted to stay a little more local, we visited the small village of Confolens Saint Germain. Downstream of the main town of Confolens, it's quite a sleepy village overlooked by a large castle, which itself is flanked by small crops of grapevines. On a walk up to the castle, it's worth continuing up to the top of the hill, and the viewpoint overlooking the large lake which is the source of hydroelectric power for the commune. The lake is held back by a small barrage which can be reach by returning the the castle, and then picking up a footpath to contour around the side of the hill, before dropping down to the barrage itself. We then followed the small river back into the village. Unfortunately, quite a few of the local trade has moved out, but it doesn't detract from the appearance of the village itself. Be aware though, the streetlights are all turned out at night. This does make it an awesome location for some wide-field astrophotography though. Especially using the buildings in the village or the castle itself in the foreground. Fancy a brandy, or to be more precise, Cognac? We made the decision to go and visit this rather famous city. With elements of it's 14th century city walls still standing along side the river, it's a place famous for the drink and all the different producers that it accomodates. We visited quite late in the season, so its worth remembering that not all of the visitor centres are open throughout the low season. Undoubtedly, there is much to do in Cognac. Another thriving city with lots of bars, shops and restaurants. At least, that's the impression it initially gave. We couldn't believe how quiet it was there. The busiest time of the day seemed to be lunch time, but even then, you weren't exactly knocking elbows with people. I would really like to go back and visit the city again during the main season, just to experience the place in all it's glory. And what about the astronomy? Well, as many people can already vouch for, the location and setting is ideal. The week we visited Astrofarm was full moon week. The meteorological conditions for observing were very good for most of the evenings we were there, but the full moon restricted us to visually observing only the brightest of objects in the sky above us. We had room in the car as we were driving out, so I took some of my own kit out with me, in particular my Celestron AVX mount. Not that there is a lack of equipment at Astrofarm. There is a huge array of all sorts of scopes and mounts to use, but I wanted to continue my efforts of practising getting my own equipment set up as best I can. With someone of Andrews knowledge and expertise to offer advice and help, it seemed silly not to try and tap into that mass of information. In fact, one evening, we worked together setting the mount up to determine how accurate we could get the alignment process, but it proved to be beneficial to the both of us as this was the first time that Andrew had used this particular Celestron mount. Towards the end of the week, with the moon rising later it allowed us to finally roll back the roof of the observatory and fire up the equipment that Andrew currently had set up. An area that I am getting more interested in is astrophotography, so to see everything being put into action by Andrew was quite simply inspirational. I learnt so much in those short hours by talking and watching Andrew go through target selection process, guiding and even some hints and tips for post processing. I finished that evening having learnt a huge amount. The week also coincided with the peak of the Orionid meteor shower. Such is the expanse of sky with virtually uninhibited vistas in all directions, the farm is ideally situated for this type of wide field of observing too. Over the course of a few nights, we saw quite a few, bearing in mind it only has an hourly rate of 20 per hour at it's peak. One of the best I saw cut across over a quarter of the sky and left a green and yellow trail across the sky. Just stunning. So, that's a brief roundup of our stay at Astrofarm. As you can see, it's not just for astronomy. There's so much more to take advantage of in this awesome location, but if you do go purely for the astronomy, I don't think you'll regret it one bit! With the plans that Andrew and Sue have for the future, it's just going to get better and better. The critical question, would you go back? The answer, yes, for sure. The warmth and hospitality given by Sue and Andrew coupled with the location for so many different attractions and the whole provisioning for astronomers make it hard to beat. Another 3 for 1 update! It's been a pretty hectic couple of weeks since coming back from AstroCamp in late September, and things don't look like their going to ease up any time soon. Next week, I'm off on my very first astronomy holiday to France, although it is full moon week, so quite how much worth while observing will be done in debatable. Nevertheless, the break is what is needed at this moment in time. The astronomy will be an added bonus. I've had a few sessions since returning back from camp, so this is the summary of what I've been up to. Straight off the back of AstroCamp, I was back outside the night before I was due to return back to work. The conditions were favorable, although I needed to be careful not to get carried away with a late night. This was to be a quick session, out the back garden with the SBT. First up was the double cluster in Cassiopeia followed by a quick slew of the scope around to the Whirlpool Galaxy in Canes Venatici. Many people associate this galaxy with Ursa Major, and, though it is very close, actually, it is within the boundary of Canes Venatici. My next target for the evening was The Ring Nebula, and with the prevailing excellent observing conditions, I was able to observe the companion star next to the nebula with relative ease. If found on this occasion, it was best observed with the 12mm BST eyepiece and UHC filter. Then, for a last target for this quick blast of a session, I went to the Veil Nebula. Here, I spent a reasonable amount of time comparing the views I was getting when on camp, to what I saw from the back garden. Probably unsurprisingly, the views I had from camp were better. I don't necessarily put this down to the overall barker skies, or better seeing conditions, but probably more to do with my night vision being disturbed by the occasional light being switched on from the neighbors as they went about the normal business. Nevertheless, I was still able to see the Eastern and Western Veil with the 40mm eyepiece and the UHC filter. Notably though, it was harder to see the broom end of the Witches Broom, and the region known as Pickering's Wisp wasn't visible to me at all. Still, it was great to be able able to observe it again though. At this point of the season, it's really hard to let a clear night go to waste. Though tired, I wanted to be able to get out and do something, so I set up the AVX mount and connected everything up that I needed to try and collect data for another image. I decided that it would be worth a crack at the Witches Broom, part of the Veil Nebula in Cygnus. For some reason though, it took several attempts that evening to get my alignment right. I think it could have been something to do with a slight shift in the mount as it settled down into the soft soil of the lawn. In the end I got it to an accuracy which was OK. But then I faced another problem. I found it hard to achieve an accurate focus using the meter readings on Backyard Eos. The main issue was that I couldn't get a suitably bright enough star to appear in the field of view. Time was getting on, so I just went with a bit of trial and error and best endeavors. I took two sets of Light frames, so, in theory, I could then compare the difference with two final images. I'm still trying to get a suitable image out from either set of data. The focus isn't brilliant, but I can get an image to come through showing some of the detail in the nebula. Unfortunately though, in order to do this, the image turns really 'noisy', Very grainy in appearance which kind of spoils the rest of the image. I will continue to try, but I might have to put that one down to experience. The imaging process can't be rushed, and at the end of the day, I could probably do with at least twice the amount of light frames and dark frames. Even to the point of running to an hours total of lights. We shall see! I decided on a visual session because it’s quicker and easy to get going with the SBT rather than carry out alignment processes required for astrophotography. It was quite a busy night! I started off with a favorite for this time of year, the Owl Cluster in Cassiopeia. Often, a degree of imagination is needed to establish why an object, or a target is named as so, but the Owl Cluster simply leaps out at you, and the shape of the owl with its bright eyes staring straight back down the eyepiece at you is very easy to distinguish. Next, staying in Cassiopeia, the Double Cluster NGC 884 and NGC 869. While on the theme of clusters, I moved the SBT to point toward M71 in Sagitta. It’s a small cluster in comparison with the ones I had observed earlier, but with the help of the 12 inch mirror in the SBT I could see the small tight cluster nestled in among several brighter surrounding stars. Clusters seemed to be the topic of the night because the next target was an open cluster in Cygnus, M29. This is also known as the Cooling Tower, and though reasonably easy to see and locate, it is one of those targets that I find hard to understand how it got its name. It was time to move onto a nebula, and another favorite for this time of year. The constellation of Lyra is almost at zenith at this time of year, so I attached my UHC filter to the eyepiece and went off in search of the Ring Nebula, M57. Being straight up above us, it means that we can observe it through the thinnest part of the atmosphere at the moment, giving us the theoretically best views we can get. Chopping and changing between eyepieces, I wanted to have a go at finding the central star to the nebula, but alas it wasn’t to be this time. It’s one of the few targets where the colour of the object comes through visually. Especially the Deep Space Objects. Most of them initially appear as grey smudges, the Ring Nebula is different and always worthy of searching out. For the final target of the evening, I chose something that I don’t often search for on purpose. Some people love observing individual stars, be they variable stars, double stars, star associated with nebulosity etc. but they are not something I search out specifically. The target was the variable star, Herschel’s Garnet Star on the edge of the constellation of Cepheus. It stands out easily amongst its neighbours and is relatively bright. It’s a beautiful orange colour, and at just under 6000 light years away, comparatively speaking, quite close! That's about everything up to date. There is a potential for some reasonable weather at the start of the working week, so I might be able to squeeze in another session before we go on holiday. Failing that, the next time I post, it could well be from France! Until then, clear skies!